Maverick. Rebel. Nonconformist. A question mark for Indian Classical Music. Pandit Kumar Gandharva has been described likewise by different people. Today he is one of most well-documented musicians of the country. The number of books, articles, online posts and videos about him are a testimony to this. This site is an attempt to put together different facets of this genius in one place. It is my humble tribute to Kumarji, who continues to give many hours of listening pleasure. In Hindu mythology, Gandharva are heavenly spirits that possess exceptional music skills. In 1935, an 11-year old boy gained popularity as 'Kumar Gandharva' (meaning young gandharva) and lived up to this title bestowed upon him. Nobody ever referred to him by any other name after that. Born on 8th April, 1924 at Sulebhavi in Karnataka, Shivputra Siddharamayya Komkalimath died as Pandit Kumar Gandharva on 12th January 1992 at Devas. For research scholars and academicians, he is the renowned singer who created new raagas, conceived several theme-based programs, and received Sangeet Natak Academy Award and The Padma Vibhushan. But for millions of his fans, he is not Pandit Kumar Gandharva. To all of them he is just – Kumarji. Amongst many of the distinguishing features of his singing, the ones that stand out are – emphasis on words of the bandish and singing in madhyalay. Singing in madhyalay is like a tightrope walk – a little slip on either side can make it sound like vilambit or drut. A simple glance at all bandish sung by him is enough proof of Kumarji’s supreme command on madhyalay. He was a strict disciplinarian in his approach to concerts. He would prepare detailed notes well in advance about what he planned to sing, and disliked any last minute requests from fans. He is known to have said, “In my notes, when I write the bandish that I plan to sing, I even mention how long each aavartan (one rhythmic cycle) would be in terms of seconds”. Kumarji's illness with tuberculosis had rendered one of his lungs completely dysfunctional. He had to adapt his breathing technique to this limitation. He may have lacked two functional lungs, but what he had in abundance was an inquisitive mind and a fighting spirit that enabled him to create his own unique style. It would not be an exaggeration to say that there have been many greats in the field of classical music before Kumarji, and there will be many more in future, but there will be only one Kumarji. There’s an interesting episode related to this. 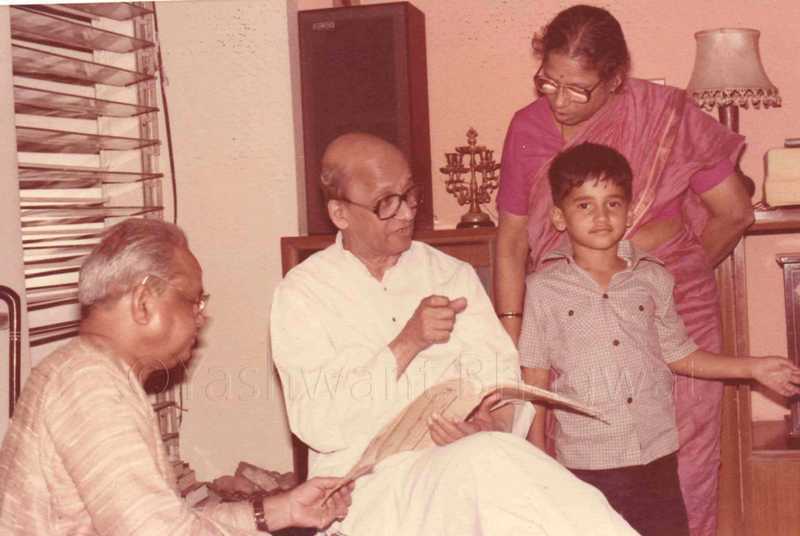 The then Ruler of Sawantwadi province felt that the boy must be simply memorizing by listening to records repeatedly. So to test his point, he bought a recently released record of Rahimatkhan's 'Chhedo na' in Bhairavi, and asked the little boy if he could sing it. Barely had the record started playing, that Kumarji reproduced the whole composition without any effort! Newspaper accounts of his concerts in 1936 bear testimony to his rising popularity. However, his father also realized that Kumarji required systematic training under a guru. He was sent to Prof B.R. Deodhar’s Indian School of Music in Mumbai, where Kumarji stayed for over 10 years. 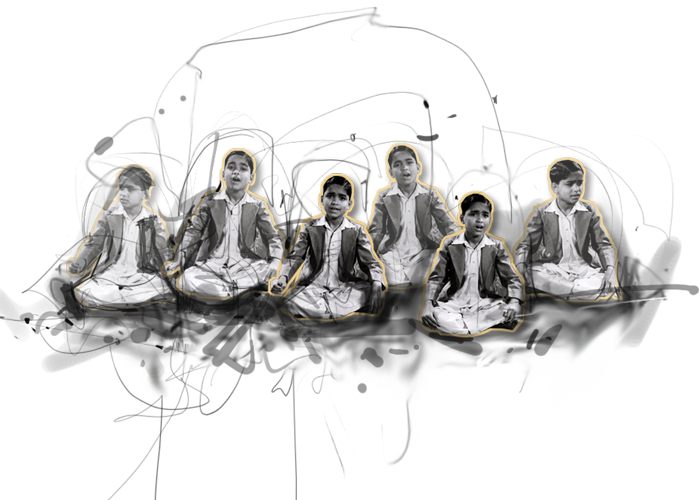 This is where Kumarji underwent rigorous training in the fundamentals of music in the true Gurukul tradition. Kumarji and Bhanumati Kans (another disciple of Deodhar) fell in love and got married in 1947. However, fate had a difficult test in store for him. He was diagnosed with tuberculosis, which had no known cure at that time. Doctors forbade him to sing and advised him to move to some place with dry climate. Kumarji shifted to Devas to recuperate from this life-threatening illness, and Bhanumati nursed him throughout this phase. For five agonizing years, Kumarji silently lay in his bed thinking about music. These trying times proved to be like a penance. Rural folk from Malva would pass by his home, singing folk songs. Kumarji listened to these melodies and contemplated on their relation with classical music. The magical efficacy of Streptomycin for curing TB came to be known in the early 50s, and to the huge relief of his friends and admirers, Kumarji stepped back on the stage of classical music, and never looked back after that. Tragically, Bhanumati passed away during childbirth in 1961 and Kumarji was engulfed in despair. His first son, Mukul, was just 6 years old. In the month following Bhanumati's demise, he was to perform in Mumbai. When the organizers heard the sad news and offered to cancel the program, Kumarji turned it down and went on to perform. A testimony to his commitment to music even in times of despair. Soon afterwards, Kumarji married his disciple Vasundhara Shrikhande, and for thirty years after that, she accompanied him in concerts all over the country. Presenting one single raag in the whole mehfil (concert). This was unheard of then. And it still is, since nobody has reproduced this after him. In this manner, he would present different profiles of a raag. The raags that he chose to present like this were Kalyan (known popularly as Yaman), Bhairav and Gaud Malhar. 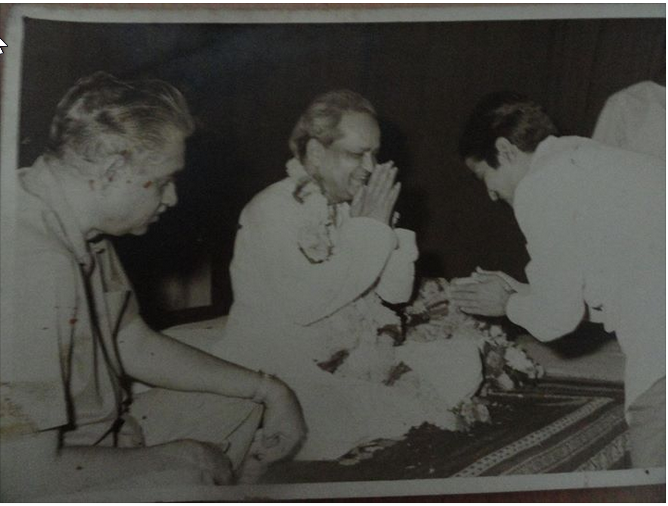 Kumarji was fascinated by the poetry of great Indian saints like Surdas, Meera, Tulsidas and presented many of their compositions with a touch of classical music. But he is best remembered for his rendition of 'Nirguni Bhajans' of Kabir. Nirguni means formless, or amorphous. His Nirguni Bhajans like ‘Nirbhay nirgun gun re gaoon’, ‘Avdhoota gagan ghata gaharani’, ‘Ud jayega hans akela’, ‘Avdhoot yugan yugan hum yogi’, are unforgettable imprints on the canvas of Hindustani Classical music today. During the peak of his career he commanded a very high fan following all over the nation and Maharashtra was no exception. He caused many an eyebrow to be raised by choosing to present the compositions of Balgandharva, the legendary marathi stage singer. This did not go down very well with many purists, but all the criticism did not deter him from continuing with his experiments. His rendition of melodies based on seasonal cycles, namely Geet Varsha (Monsoon), Geet Hemant (Autumn) and Geet Vasant (Spring) are quite unparalleled in the history of Indian music. He presented the passage of each season using folk compositions and his own creations and thoughtfully included compositions that celebrated festivals occurring in those seasons. 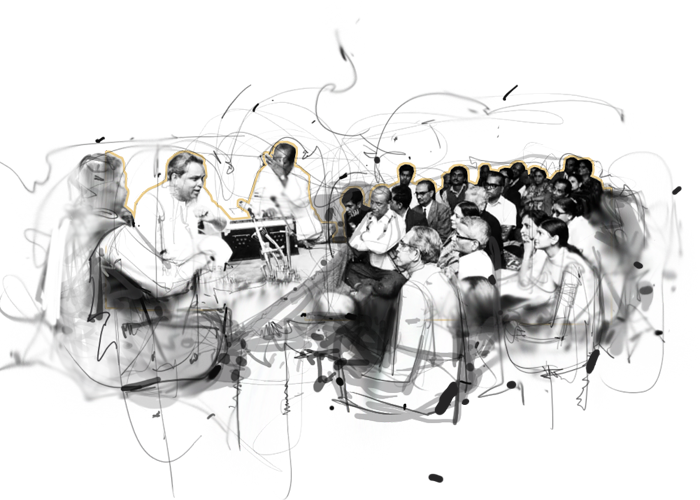 Kumarji's keen insight and spirit of enquiry resulted in him studying the facets of various Gharana (schools of music) of Indian music, but he did not stick to any one of them. It would be fitting to say that he became a Gharana unto himself. His legacy is being carried forward by his disciples, including his immediate family, Vasundhara Komkali – wife, Mukul Shivputra – son, Kalapini Komkali – daughter and Bhuvanesh Komkali – grandson. His other notable disciples include Meera Rao, Vijay Sardeshmukh, Satyasheel Deshpande, Madhup Mudgal and Pandharinath Kolhapure, among many others. This gallery is a product of contributions from fans who have graciously shared memories from their personal collections for publishing on this site. Note – Please send us photographs only from your personal collection and not those already posted on the internet. We would publish the images with due credit to you, but we don't take responsibility for anyone else later claiming ownership for these images. Click here to submit photo. Click here to submit video. Koi Sunta Hai – By Shabnam Virmani - (The kabir project, Srishti, 2008) This documentary is actually about Kabir and Kumarji. 'Gandharva Gaan' – a documentary by Vasanti Muzumdar. तरीही एकाकी (Tarihi Ekaki - in Marathi) Translated by Chandrakant Patil. Marathi Sahitya Parishad. एक नायक आणि एक (खल) करणारा गायक – Satyasheel Deshpande. Published in 2005 Diwali issue of Shabd magazine. कुमारजी – एक चिरंतन सूर - by Pushkaraj Apte – Published in June 2012 in Navrang, the e-magazine of Dubai Maharashtra Mandal. पावा मै दुरासे – Shubhada Chirmule – Published in 1993 Diwali issue of Mauj. फेर आई रे मौरा – Vasanti Muzumdar - Published in 1993 Diwali issue of Mauj. शोक – an obituary by Suneeta Deshpande in 'Soyare Sakal' – (pages 68-81). Originally published in Maharashtra Times on 5th April, 1992. Kumarji’s musical genius inspired many to pen down their appreciation in form of poems. Two of these are reproduced here. 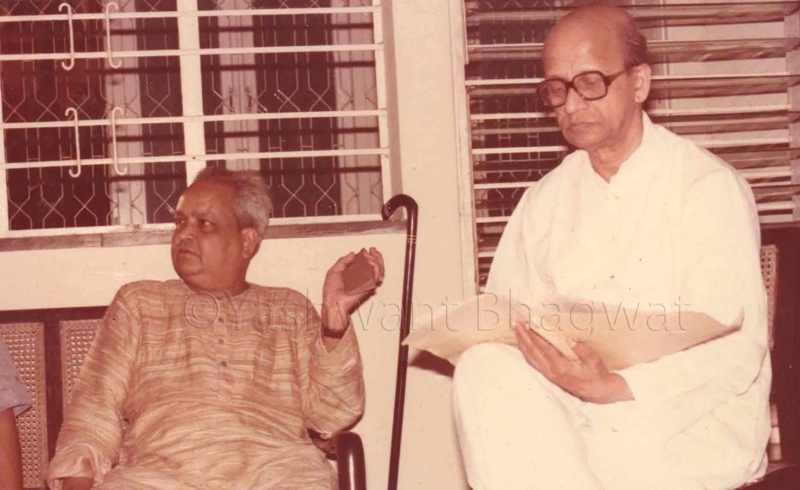 The one by Dr. Yashwant Bhagwat was published in Diwali issue of "Mauj", while the one by Vasant Bapat was published in a commemorative volume to felicitate Kumarji when he turned 60. When it came to conveying his thoughts to the listeners, Kumarji displayed an eagerness probably unmatched by any other singer. A brochure was published at each of his thematic concerts. A few sample pages from these brochures are reproduced here. I am indebted to Shri Mukund Padhye for giving me access to these valuable archives in his collection. 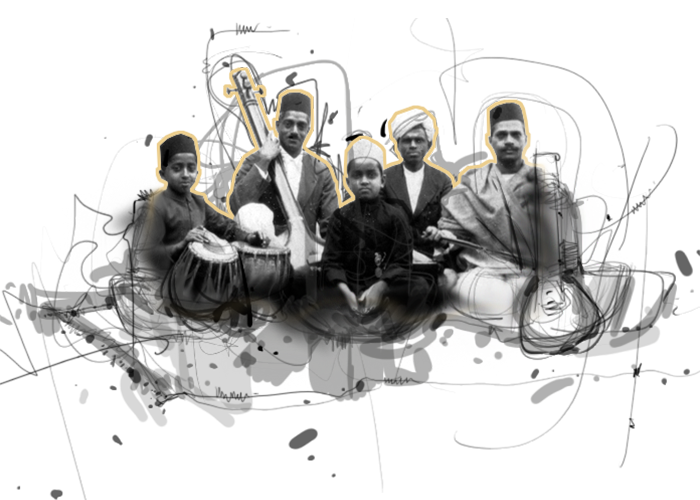 Please note that this is not a comprehensive database of all raags or bandish in Hindustani music. It is only a list of compositions sung by Kumarji. If your search doesn't yield results, try different spellings. For instance try Marubihag instead of Maru Bihag, Bageshree instead of Bageshri, or Patmanjiri instead of Pat manjari. Searching for a particular bandish can be a little trickier. You may have to try savan, saavan, saawan and sawan – before you finally hit upon ‘Sawan jhar aayo’ (Maghawa), ‘Sawan jhari’ (Megh Malhar), ‘Sawan ki saanjh’ (Shyam Kalyan) and ‘Lago sawan maas’ (Barmahi lokgeet). Now your search will of course also show up four bandish in Raag Sawani. The laya mentioned for each entry can be a matter of debate, because one person’s definition of madhyalaya can differ from that of another. Kumarji’s vast repertoire of music consisting of khayal, thumri, tappa, tarana, bhajan, etc. is like a vast ocean and it is well nigh impossible to organize it to perfection. For example, I could find more than 30 different compositions in Bhairavi alone. Those in Bageshree, Gaud Malhar and variants of Kalyan won’t be far behind either. And yet, I am aware that this list is by no means complete. I have made an attempt to sort all the data according to raag, taal laya, bandish and so on. Do write to me at info@kumarji.com if you come across any errors or omissions. The only purpose of this database is to illustrate the versatile musical genius and virtuosity of Kumarji. Kumarji was an explorer in every sense of the word. Never remaining content to rest on his laurels, he continued to look beyond the present. For him, his musical quest became an endeavour to reach the horizon, with the awareness that the horizon would only keep getting further, and that the journey was greater than the goal. 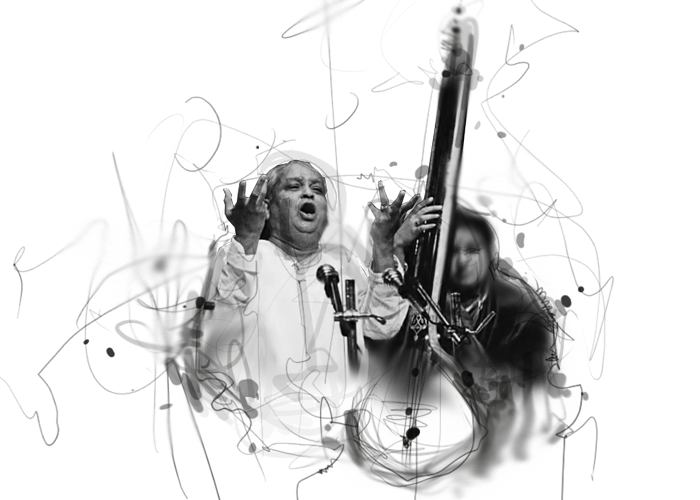 Khayals, thumri, tappa, tarana, bhajan, bhavgeet, natya-geet, lokgeet – Kumarji didn’t hesitate to explore all of these. Below is a list of some famous concerts. Click to view details. Stories about artists and their lives, especially mavericks like Kumarji, often take on a mythical quality. In this section we would publish only first-hand accounts, not stories that are hearsay. I am fortunate to have met many people who knew Kumarji personally, and could gather many interesting anecdotes. I am indebted to all who shared these priceless moments with me. Like the doctor who once drove Kumarji from Pune to Mumbai and dared to tell him that he didn't really like Geetvarsha. I do look forward to receiving many such anecdotes and memories from you. I recall many years Kumarjee use to perform at the residence of Dr. V.N. Kajwadkar in moti bangla Dewas on the occasion of Dr's birthday. The moment he use to enter in the hall I remember his comments with a sweet smile on his face and looking at my father Dinesh Supekar to whom he use to call "Dinu" ARE WA DINU CHI ARRANGMENT DISAT AHE. He was very keen on neat and clean white bichayat during his performance which my father personally use to handle. All good old memories. I was driving from Pune to Mumbai with Kumarji and Vasantrao (Achrekar). I said to him, “I haven’t really liked Triveni and Mala umajlele Balgandharva. Soon after I had said this, I was petrified whether I was overstepping my boundaries. After all, I was just in my 20s, and wondered whether I should have been so upfront with him. He asked for the reasons behind my thought, and I went ahead and shared my opinion. To my delight, he didn’t get upset but answered all my queries. It was significant that he did not force me to change my opinion. प्रत्येक संगीताच्या भागावर आपण प्रेम केलं पाहिजे. प्रत्येक संगीतात जो भाग आहे तो फार समृद्ध आहे. . . . त्याची दुनिया वेगळी. ती दुनिया कळण्यासाठी ह्या दुनियेतून कंप्लीट तुम्ही निघून जा तिकडे. मला संगीत येतंच आहे, असं त्याच्याकडे बघू नका. चष्मा काढून ठेवा म्हनजे कळेल, लोकगीत किती वरच्या दर्जाचं आहे ते. म्हणजे तुळशीला मंजिरीच आली पाहिजे, फूल येऊन चालत नाही. कारण मंजिरी म्हणजे त्याचं कॅरॅक्टरिस्टक. ते काहीतरी सांगतं. आंब्याला मोहर येतो तो काहीतरी सांगतो. लोकगीताकडे बघायची तुमची नजर नाही, तर ते बिचारं काय करेल? कारण लोकसंगीत हे कुठल्या कमावलेल्या आवाजात गात नाहीत, स्वाभाविक आवाज काढून गात असतात. कारण कुणाला खूष करायचं नसतं त्यांना. ह्या परिष्कृत कला आहेत ना. ह्या दुसऱ्याला खूष करण्यासाठी असतात. रागसंगीत दुसऱ्याला खूष करण्यासाठी - माझ्यासाठी नाही. त्याला वाहवा नको, तुम्हाला वाहवा पाहिजे, किती फरक ह्याच्यामधे! तेव्हा ज्याला वाहवा नको त्याचं सौंदर्य तुम्हाला कळण्यासाठी - कुणी तुम्हाला वाहवा देणार नाही. ही पहिली गोष्ट. तुम्हाला त्याचं सौंदर्य कळलं पाहिजे. कला सारखी बदलत असणार, जी जन्माला आली की मृत्यु आहे त्याला, अशाला तुम्ही सारखे बांधून ठेवता, म्हैस बांधल्यासारखे? संगीतासारखी कला सारखी बदलत असते, म्हणजे त्याचं शास्त्र बदलत नाही, त्याचं सौंदर्य बदलतं. सर्व शरीराचा (गाण्याशी) संबंध आहे. मी गायला बसतो तेव्हा सबंध शरीर व्हायब्रेट होत असतं. असं केलं की आवाज बाहेर पडतो. कारण सबंध शरीर काम करत असतं. नुसता गळा काम करत नाही माझा. नुसतं नाक काम करत नाही माझं. माझा संबंध डोक्याशी व शरीराशी असतो. म्हणून मला ताकद ही लागतच नाही गाताना. ती येऊन जाते. ती येते आणि जाते. मी आवाज काढण्याच्या पद्धतीमुळं आणि गाणं संपलं की तितकाच फ्रेश असतो, पुन्हा गाणं विसरून गेलेला असतो. मला रागांची, राग-रूपं फक्त माहीत असतात आणि बंदिश माहिती असते. तिची निर्मिती मी कधीच ठेवत नाही. कारण निर्मिती ही लक्षात ठेवायची गोष्ट नसते. जसा भैरव. सकाळचा राग आहे. तीर्थक्षेत्री सकाळचं पावित्र्य जर तुमच्या मनाचा ठाव घेऊ शकलं, तर तो भैरव काय म्हणू चाहतोय ते तुमच्या लक्षात येईल. सारंग राग गाण्यापूर्वी दुपारी दोन वाजता खेड्यात जाऊन शेणाने सारवलेल्या ओसरीवर बसला आहात का? तसे बसलात तर सारंगचा आत्मा कळेल. भीमपलास म्हणजे पळसाची मोठी पानं. वसंत ॠतूत दुपारी साडेतीन-चार वाजता पळस वृक्षाखाली उभे राहिला आहात का? मग मोठा पळस काय आणि भीमपलास राग काय सांगतोय ते कळेल. गोरज मुहूर्त आहे, माजघरात पणती तेवत आहे. भूक लागलीये असा हट्ट पोराने चालवला म्हणून आईने कणीक तिंबायला घेतली आहे. पोराचा बाप दुधाची कासंडी घेऊन घरात शिरतोय. खेड्यातील झोपडीतलं ते जीवन अनुभवलं, तरच पूरियाचा मध्यम इतका हळवा का ते कळेल. संध्याकाळचं तांबडं क्षितिज, त्यावरील शुक्राची चांदणी मनात ठसली तर गौरी राग थोडा समजेल, गौरी बुरखाच घालून बसलीये. तो वर करायची गायकाची हिम्मत हवी. समजा, बुरखा काढला नाही तर गौरी बोलत नाही. तिला बोलतं करावं लागतं. This is not a free music download site. It is only a site expressing respect and gratitude to a creative genius who dominated the classical music stage for more than half a century. Presenting compositions of three saint-poets, each one as different as can be, was a challenge that Kumarji met with consummate ease. 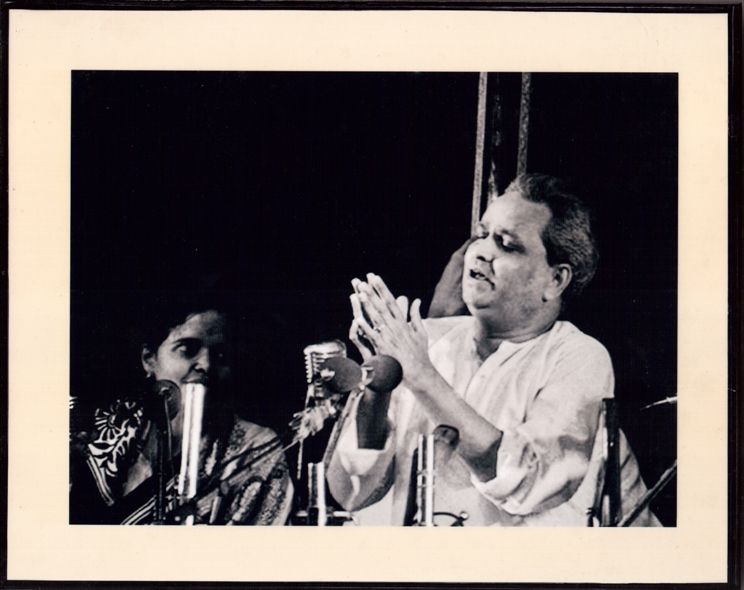 The concert began with Kumarji’s own composition (written under the pseudonym of ‘Shok’) which describes the unique characteristics of the three poets. What better way than this to open the concert! It is significant to note the choice of raag (and I think the taal too) that Kumarji chose for the compositions. I will attempt to illustrate with just one example of each. Surdas’ pain and longing when he says “Kabahu na mitat sada pawas brij, laagi rahat jhari” comes alive with the Raag Jhinjhoti in slow Keherwa. When the reference of rain returns in another composition to express acute longing, Kumarji chooses Bihagada (with Keherwa again, but much faster this time) for singing “Bin pawas pawas ritu aai, dekhat hai vidman”. Compare this with Meera’s unconditional surrender to Him – “bhavsagar mein bahi jaat hoon, beg mhari sudh leejo ji”. Kumarji also ‘surrenders’ to Bhimpalas to convey Meera’s state of mind. Not all of Kumarji’s experiments went down too well with the purists and pundits, and Triveni was no exception. There was criticism that the vast difference in each composition did not create a ‘unified picture’ of the concert as a whole. One wonders, however, whether that was Kumarji’s purpose anyway. The importance of rains can hardly be overstated. With Geet Varsha, Kumarji depicted the multitude of emotions that the four months of rains evoke in the Indian mind. This was one of his first forays into thematic concerts, and the first in his exploration of the seasonal cycles. He divided the months of Jyeshta, Ashadh, Shravan and Ashwin into three parts and aptly called them Bauchhar, Jhadi and Rimjhim. These words have no parallel in English! One has to experience the Indian rains to fully understand what these three mean, and Kumarji did exactly that. There are countless traditional compositions describing the rains, and Kumarji dived deep into various sources to pick 25 of these compositions. As an artist he was blessed with a state of ‘divine discontent’ and included his own compositions wherever he found gaps. Kumarji was attentive to the essence of each facet of nature, and his keen sense of observation picked up all minute changes happening around him. For his inquisitive and sensitive mind, the unending cycle of seasons was not just a weather phenomenon. It was the cycle of life itself; life with its mixture of happiness and sorrow, unions and separations, striving and contentment, and much more. To enjoy the rains fully, one has to first live through the stressful scorching summer, which Kumarji depicts with ‘Gham pare re’ in Marwa. The first clouds appear shortly thereafter, but they turn out to be just a vacant hope. In fact, they only increase the discomfort. Kumarji follows this with a ‘Barmahi lokgeet’, which is a signature melody throughout all his Geet Varsha, Geet Hemant and Geet Vasant. It is a haunting melody, heralding the passing of one season and onset of the next one. The cycle of life goes on…. These months are also the time for festivities. Kumarji included the references to not just the major events of Gurupurnima, Janmashtami and Ganesh chaturthi, but also to events like Teej, womenfolk visiting their parents, the jhoolas and such other ‘local flavours’ of the rains. While the rains bring boundless joy happiness and festivities, Their departure brings a period of quiet contentment. The parched earth of summer is now a hazy memory, as the entire landscape is lush green. It is time to count one’s blessings, the time to enjoy a good harvest, of which Kumarji reminds us with his superb ‘Heera moti nibaje’. The rains have left behind a state of prosperity and fulfillment, but it’s not the time to relax. Quite the opposite, because it is time to venture out for new conquests. Warriors will pray to the Goddess Shakti, bring out their weapons and armour, and set out to seek glory. Just a moment. The grand design of nature also seems to give us another message. Hold on, don’t rush. Take some time out to be with the ‘Nature within’. The thunder, lightning, torrential rains, gushing springs, rolling rivers, have all now become quiet. Listen to these silences – what are they telling you? It is also that time of the year when one is awed by the beauty of clear starlit skies. Sharad purnima comes around in all its glory with the outstanding rendition of ‘Anand zarayo ri’. A few days later, one doesn’t mind even if there is no moonlight, because every little town will be lit up with a thousand lamps. It is the time to celebrate Diwali! Kumarji takes us through the festivities of Navratra, Diwali, and Mahashivratri, and also brings us in close realization with the bitter chill of winter nights. After many long cold winter nights and foggy mornings, a day comes when the Sun begins his journey North with Makar Sankranti, thus making way for that last act in nature’s drama. Spring – Vasant rutu. But that is another story…. The winter has silently swept across the landscape. It is so quiet that one can almost hear a leaf drop to the ground. Yes, all the trees stand stark and bare. That unseen force, which we call death, has walked silently among the woods, gently shaking each tree and helping that last leaf to fall to the ground. Kumarji exhorts us get out of our cocoons and witness the spectacle of nature with his ‘Aayo basant ritu’. New delicate leaves adorn the mango tree – “nayo roop nayo paat, sohan sab birakhan ri”. It’s time to forget old decadent rivalries and forge new friendships. Go ahead and celebrate with everyone in the village. It’s a community festival of Holi! Get drenched in fun and gaiety in the celebration of colours. No wonder then that Kumarji devotes as many as ten compositions to this one festival. Even the river Narmada joins us in celebrating Holi! Kumarji brings in the festival of Ram navami, as the month of Chaitra heralds the New Year and before we realize it, one whole year has passed. The wheel has turned a full circle, but does that mean we find ourselves at the same point? So many things have changed within us. Let’s walk ahead to be in tune with the new cycle ahead of us. Over the centuries, presentation of classical music moved from the slow elaboration of a Dhrupad to the (comparatively) fast of rendition of a raag through the Khayal form. With passage of time, other forms such as Thumri, Kajri, Chaiti, Hori, Dadra etc. found their way into mehfils. Thumri, Tapaa and Tarana - these three have long been popular as ‘light’ classical forms, and along with bhajans, these are often presented at the end of concerts. Kumarji endeavoured to find out if there was a link joining these, and presented a rather revolutionary concept that thumri and tappa have the same connect that a vilambit and drut khayal in any raag have. A popular story surrounding the origin of Tarana is that Amir Khusrau conceived it because he couldn’t understand the words of any bandish in Indian languages! While Kumarji didn’t delve into the origins of Tarana, he did propose an entirely different thought about what the Tarana achieved. It was that even after expressing his thoughts in a performance by way of vilambit and drut bandish, the artist could still feel that something remains unsaid. The ‘meaningless’ phrases in a Tarana are a way to express that unarticulated part. Kumarji was a deeply spiritual person, and was influenced by the yogis of Nath sect. He frequented the seat of Shilnath Maharaj near Dewas, where he heard the bhajans sung by ‘Kaan-phate’ sadhus and was immediately drawn to them. 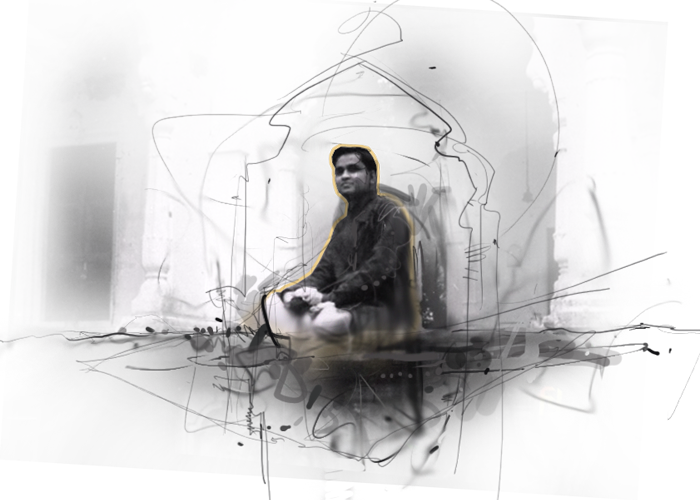 It was no surprise that Kabir’s compositions fascinated him and he chose to present these in his own unique style. Nirguni sect believes in the Supreme Power being beyond description and definition. His rendition of Nirbhay nirgun gun re gaoon, Ud jayega hans akela, Avdhoota yugan yugan hum yogi, and other bhajans have become immortal. It was a fitting tribute to Kumarji that when his mortal remains were being consigned to flames, a group of Kanphate sadhus came and sang ‘Hum pardesi panchhi baba”. An excerpt from Shri Ananthamurty’s poem, which was inspired by Kumarji’s concert in Mysore in 1989 captures the connection that Kumarji found with Kabir. as if to note your own location. on your back for a while. Singing, you laughed and smiled. 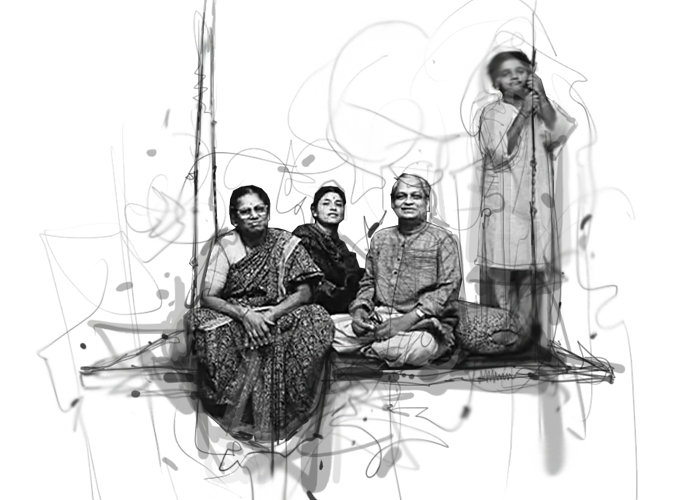 Balgandharva ruled the Marathi theater for five decades. No discussion on Marathi music-dramas can be complete without a reference to him. When an artist achieves such levels of popularity, anyone else trying to present his/her singing has to face immediate comparison that is tinted with bias. Naturally, many purists considered it a sacrilege when Kumarji chose to present his understanding and interpretation of Balgandharva’s songs in this concert. Kumarji’s attempt was to show that Balgandharva’s singing had a firm base of classical music and that just because the song was part of a theater drama did not make it any less classical. As with many of his other experiments that faced criticism, this one was no exception. The commonest complaint was that Kumarji’s Marathi pronunciation was flawed due to his Kannad upbringing. What matters today for his fans is that none of this deterred him from exploring various aspects of music!